Where in the World has Michael Antonelli Gone? Equities start the day higher as May descends upon us! May… the fifth month of the year… does anyone else feel like their life is in hyperdrive? Mine sure is, my 11 yr. old son is taller than my wife now. Oh the humanity. Here’s a question for you: Where in the world has Michael Antonelli gone? Well my friends, the story is long and boring so we’ll just stick to the long part. I spent April travelling the globe for both personal and professional enrichment. Managed to circle the planet on an airplane spreading the gospel of Bull and Baird while learning that “let’s go out for Schooners” is a thing in Australia. That’s gotta be the best way to say “let’s get a beer” right? Nothing is even close. I even spent a long weekend on the Exuma islands in search of millennial glory at this thing called Fyre Festival. If you ever wanted to see despair on the face of a rich 23 year old that was the place to be. I mean we aren’t talking “my soy half pump two shot chai latte was cold” despair we’re talking “I spent $5k to be with Instagram models and all I got was a lousy cheese sandwich despair.” Actually I wasn’t there but it was my favorite story over the past week so do me a favor and read that first article I linked. But we’re back and the market is sitting at all-time highs because 1) earnings are fine, 2) everyone still thinks the market is expensive (probably the top comment I heard on my travels), 3) economic data is fine, 4) Europe/Asia is looking a LOT better, 5) breadth is fine, and 6) people are a lot more realistic about what Trump can do. Sell in May and go away? Please, is there anything more tired than that phrase? Maybe me but I lay it all out there for Baird! Ok let’s get into it because all of Europe was closed and I have plenty of time for you! After the open we had a relatively quiet morning that featured a few macro data points. ISM Manufacturing printed 54.8, same as it ever was, Markit Manufacturing PMI hit 52.8, same as it ever was, and core PCE rose 1.6%, same as it ever was. You know all these people saying “well we need macro to improve for the stock market to go higher”… have they seen the last 7 years? You know what the average ISM Manufacturing has been since 2010? 53.7. But what about GDP Mike, don’t we need 3-4% growth to get the stock market higher? Hahahah, no. Everyone waiting for the “perfect economy” has missed generational alpha, don’t get caught thinking the US is going to switch into some magical high gear. Ok movers and shakers time: TWTR rose 6% because their new growth may come from Bloomberg, TSLA ripped the shorts for another 2.5% because that’s how stocks act when a ton of people are off sides, and AMZN hit a new 52wk high of $954 because Bezos is a genius. So, I know it’s been a while since I wrote but do retail stocks still go down every day? Hmmm, let’s look at the top 10 losers in the S&P today shall we? BBBY -3%, ORLY -2.6%, VFC 2.6%. 3 of the 10? Improvement!! Around lunch time a quote from Trump hit the news wires where he told someone that he is “considering breaking up Wall St Banks”. Oh is that right? You want to roll back a bunch of Dodd Frank, have two ex GS partners in Cohn and Mnuchin on staff, yet you are considering breaking up big banks? What? Can we just stay on message here for a day or two? The ball is on the tee my man, just hit it into the outfield please. By lunch we were sitting just shy of new ATH in the S&P, 2,394, up 0.4%. The rest of the day saw us get REALLY close to those Mar highs but a late day selloff put us back under the ceiling once again. So, so, so close my friends, let’s my hope my triumphant return to blogging doesn’t jinx us. I for one think this market still have upside left in it. Why? Because we haven’t seen the euphoric phase and far too many people I talk to are waiting for a pullback. Trump is gonna Trump and economic data is what it is so don’t think those two are upside drivers. Good ole fashioned earnings growth will help, asset allocation will help, sentiment will help, and optimism about our future will help. S&P 2,400? Feels like it will be in the rear view mirror soon. Final Score: Dow -13bps, S&P500 +17bps, Nasdaq +73bps, Rus2k +50bps. Succinct Summation of the Day’s Events: Bit of economic data, VIX new lows, markets close near the high, random Trump tweets, and lots of Sell in May articles. Exactly what you’d expect from May Day. Running will keep you alive my friends: a new review published in Progress in Cardiovascular Diseases—easily my favorite peer-reviewed heart health publication, for the record—has concluded that running, more than any other form of physical activity, is the best exercise at the all-important task of keeping you alive. AAPL is the 69th largest asset manager in the world, right behind Dodge and Cox. Right now…is the easy part: Despite headlines and your memory, this is what the market does over time. It goes up more than it goes down. Perhaps we’ve had less volatility along the way in the last year or so, but most years end green, not red. So while we won’t expect things to always be so rosy, this isn’t an abnormality. Three things that will never change in Wealth Mgmt via Josh B: 1) Financial advice is the only business where you are better off giving customers what they need versus what they want. 2) All things being equal, people do business with people they like.3) The two constants that transcend everything: Fear and Greed. Is this real? 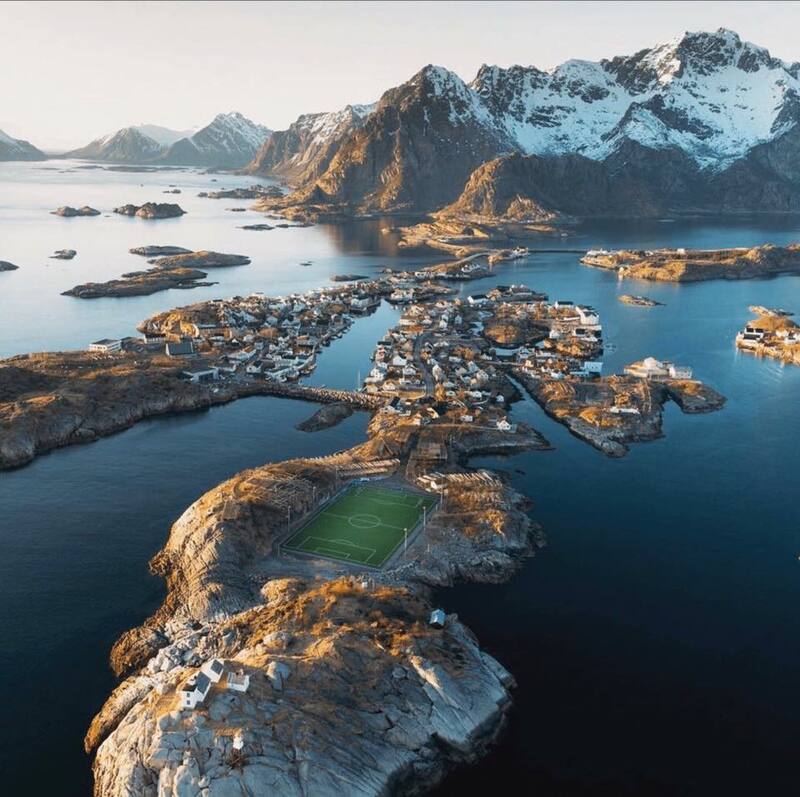 Anyone been to Lofoten? Anyone ever done that thumb trick to a kid? Of course you have, everyone does it, makes you feel like a God. This guy though… next level.